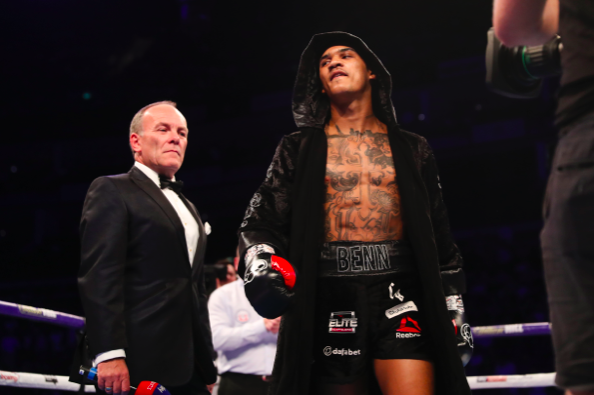 Conor Benn is itching to get back under the bright lights after recovering from a hand injury that has kept him out of the ring since his explosive rematch with Frenchman Cedrick Peynaud at The O2 in London back in July 2018. Benn makes his long-awaited return to the ring on April 20’s big Heavyweight double-header in the Capital topped by Dave Allen vs. Lucas Browne and Derek Chisora vs. Senad Gashi to make the first defence of his WBA Continental Welterweight strap. ‘The Destroyer’ raced to 13-0 (9 KOs) before requiring surgery on his injured hand after his summer clash with Peynaud, but the all-action Ilford talent is determined to make the best of a bad situation by returning with a bang later this month. “By the time fight night comes around it will have been around ten months since my last fight,” said Benn. “It feels good to be back and to have an opportunity to show everyone the progress that I’ve made during my time out of the ring. I’m still young and at this age the progression is rapid. I’m far from my prime and everything happens for a reason. “Having a few injuries has slowed everything down a bit but that’s not necessarily a bad thing. You’ve got to look on the positive side of things. During my time out of the ring I’ve been able to work on a lot of things and improve in different areas. Time out of the ring isn’t always bad, it’s how you use that time that’s important. Despite a growing demand for a huge domestic showdown with Rio 2016 Olympian Josh ‘Pretty Boy’ Kelly, Benn is keen to remain focused on the job at hand as he looks to climb the Welterweight ladder towards domestic title shots later in the year. “The main aim for 2019 is to remain undefeated and to be tested in some good entertaining domestic scraps,” he added. “I’ve been unfortunate with injuries so it’s hard for me to look too far into the future but I’d like to get another belt around my waist by the end of the year for sure. “I’d definitely be interested in going for the British title, why not? I hadn’t seen any of Chris Jenkins until he fought Jonny Garton at the Royal Albert Hall. He looked alright. I was gutted for Jonny because I’m a big fan of his but Jenkins turned up on the night and done the job. “It would have been nice for me to take the belt off Garton because he sells a lot of tickets and it could have been a much bigger fight. But belts aside, my main focus for this year is learning and developing. Let’s take it one performance at a time and see where it goes. Benn returns on a huge night of boxing in the Capital. At the top of the bill, Doncaster fan favourite Dave Allen (16-4-2, 13 KOs) faces the biggest night of his career against Australia’s former WBA Heavyweight World Champion Lucas Browne (28-1, 14 KOs) and Derek Chisora (29-9, 21 KOs) clashes with Senad Gashi (17-2, 17 KOs) in his first fight under new trainer Dave Coldwell. Sunderland’s ‘Pretty Boy’ Josh Kelly (8-0, 6 KOs) takes on the toughest opponent of his career to date in the form of unbeaten 17-0 Pole Przemyslaw Runowski, Brooklyn Middleweight prospect Nikita Ababiy (3-0, 3 KOs) makes his UK debut and Watford Bantamweight Shannon Courtenay fighting for the second time after winning on her pro debut at the Copper Box Arena last month.